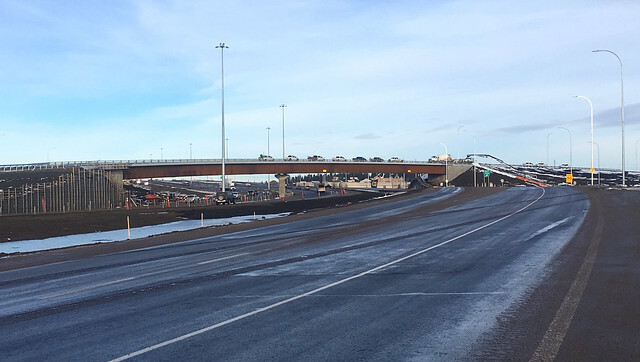 As the 2018 construction season comes to a close, the Highway 2/Gaetz Avenue interchange in Red Deer is fully open to traffic. The Gaetz Avenue interchange is now open to traffic. The new interchange will improve traffic flow and safety for highway travellers, local residents and commuters and businesses in the Red Deer area. Construction of the $80 million Highway 2/Gaetz Avenue interchange began in 2016. The project includes five new bridges, new on and off ramps for northbound and southbound traffic, the widening and realignment of Highway 2 and the integration of the Taylor Drive and Gaetz Avenue interchanges. Minor finishing work, such as final paving, signage, guardrail installation and landscaping, will be completed in 2019. The project was one of more than 195 projects included in the 2018 Construction Program. Of those projects, 139 will be completed by the end of the fiscal year and 56, which are multi-year projects, will continue in the 2019 construction season. 1,100 kilometres of roads were maintained with pavement rehabilitation work in 2018, which is equivalent to the driving distance between Edmonton and Brandon, Man. Construction of the Southwest Ring Road is now more than 40 per cent complete with full completion scheduled for October 2021. River channel alignment works are complete at all three locations. More than 90 per cent of utility realignment is complete. The roundabout at Highway 43X and Range Road 63 opened in mid-September. Work continues on the west side at the Shaftesbury Interchange and the CN Rail overpass. All project components (except the main bridge) are expected to open during fall 2019. Completion of the 98 Street overpass is expected during summer 2019. The main bridge is on schedule to open during fall 2020. Work on the east section of the project is expected to be complete in 2019. During the winter of 2018-19, two lanes per direction are expected to open to traffic. Construction of a roundabout at Highway 39 and 60 is expected begin in 2019. Design is underway for the overall Highway 15 twinning project. Construction is anticipated to begin in 2019, and is estimated to take about three years. Repaving of four kilometres of highway between Edmonton and Fort Saskatchewan was completed in 2017. Upgrades to the existing bridge substructures, concrete piers, guardrails and drainage system was completed in 2017.